However, these lenses were designed for 3CCD broadcast cameras. The lenses and cameras are specifically designed for each other, so using an ENG lens on a non-ENG camera requires some doing. This is how I mounted and powered my lens on a Sony F3. The F3 is a Super35 digital cinema camera with a PL mount (well, it’s actually FZ mount, but never mind about that.) The first challenge: the mount. ENG lenses come in two general mounts: B3 and B4. B3 was developed by Ikegami, and isn’t used any more. Instead, B4 is the standard. Lenses with B4 mounts come in 3 varieties: 1/2″, 1/3″ and 2/3″. This refers to the sensor size the lens will cover. 2/3″ is what we’re looking for. Now some sensors are small enough that a 2/3″ lens’s image circle will cover it. Sometimes the sensor is a bit too big, but if the lens has a built-in 2x extender, the expanded image circle will cover it. For a S35 sensor, an optical adapter is required. This expands the image circle to cover your sensor, while also losing some light. For PL mount cameras, the IBE Optics/Abel Cine HDx35 is the answer. MTF Services also makes a B4 to PL adapter, but I have not used it. I picked up my HDx35 used. They have since come out with a MkII version that is sharper and expands the circle a bit more to cover 2k sensors. The second issue is powering the lens. As I said earlier, ENG lenses were made for ENG cameras. The standard lens connector is a 12-pin Hirose connector. This is universal across all newer B4 mount lenses. The pinout is also the same across lens brands, so any lens will work with any camera. Your lens has the HR10-10P-12P connector. To make a custom cable, either salvage an HR10A-10R-12S from an old camera, or order an HR10A-10J-12S from Mouser. The pins that we’re concerned with are 4, 7, and 8. Pin 7 is ground (-), pin 4 is + 12 VDC, and pin 8 is record trigger. 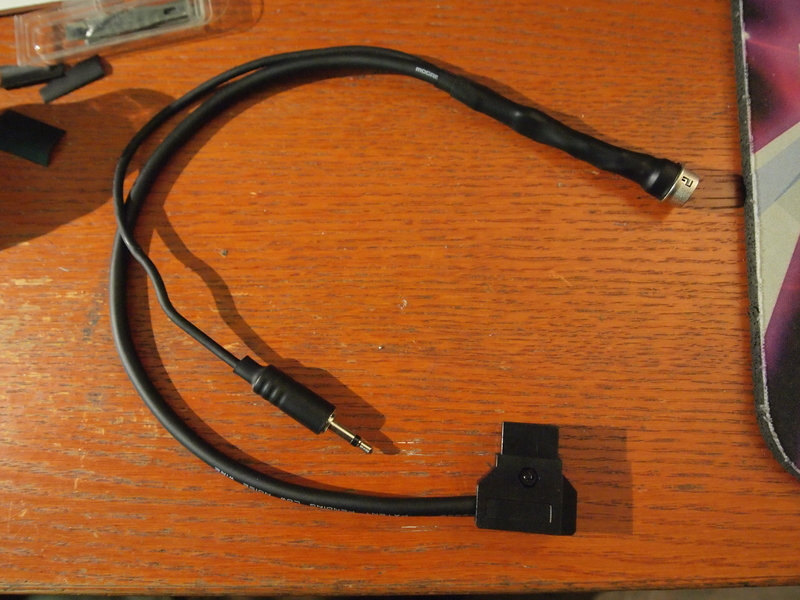 I pulled my connector from a camera, so it already had wires soldered on (probably better than I could do!) I didn’t cut off the ones I didn’t need, I just folded them over to keep them out of the way. I used a Mogami 2552 cable for power, and a thinner scrap wire for REC trigger. I would recommend Mogami W2697 for the record trigger, since it’s just a dry contact closure and isn’t carrying serious voltage. The power cable is soldered to pins 3 and 6, and terminated with a P-tap connector, since I have an Anton Bauer battery plate with P-taps. You can terminate in whatever you want, as long as you feed the lens 12-16 VDC. 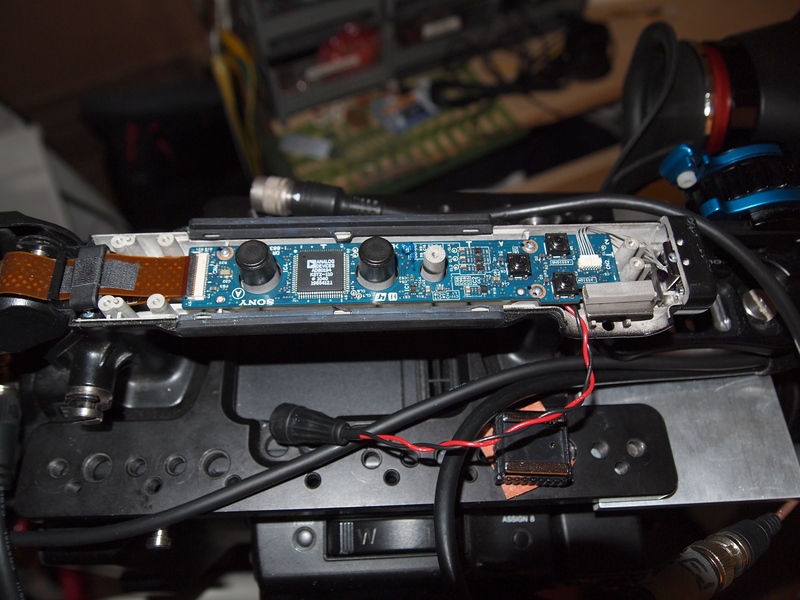 For the record trigger, I terminated it with a mono 3.5mm plug. If I had 2.5mm plugs I would have used that, so it couldn’t be mistaken for a headphone jack. Your termination depends on what camera you have and how the record trigger works. So what I did was tap into the top handle Record button. I don’t use the terrible mic clip that comes with the camera, which means there’s a small hole that gets me inside the top handle. Disassembly is pretty straightforward: two small screws on the handle, 4 more under the cold-shoe mount, and you’re inside. 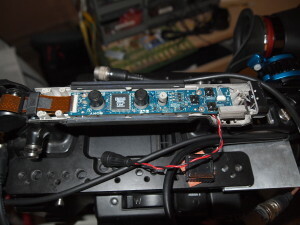 Remove 4 more screws around the 1/4-20 receptacle, three screws that hold in the board, unplug the VF cable at the back, tally/IR cable at the front, then two hidden connectors under the board, one for camera communication, and one for rear tally/IR/audio. Then the board is free. 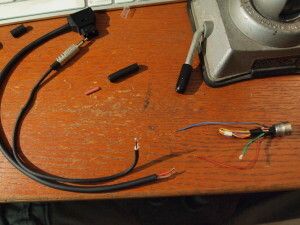 I took some 26 ga. stranded wire I had lying around, although Mogami W2368 would have been ideal since it’s so thin. 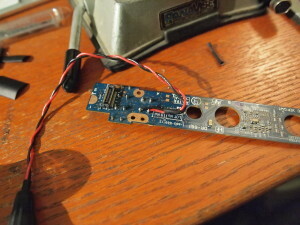 On one end I terminated it with an 1/8″ jack, the other was soldered to the top and bottom pins of the REC button. This essentially just closes that circuit externally, leaving the real REC button fully functional. The wire exits through the gap left when the mic clip is removed. 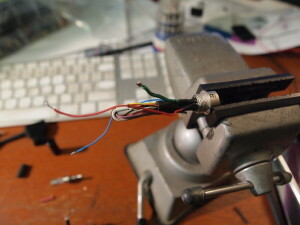 If you like the mic clip for some reason, you can drill a hole or file a notch into the handle to facilitate the wire. An even better solution would be to panel-mount the jack on the handle somewhere, possibly above the headphone jack. So now we have a cable that powers our lens, and can trigger our camera with the VTR button. The cost of this is under $60 if you get your cable by the foot (you only need about 3ft of cable, depending on your battery placement.) The single most expensive part is the Hirose connector, at a whopping $23.68 from Mouser. Film and television Director of Photography working in Los Angeles, CA. Very cool. Thanks for the pinouts. I’m in the process of making a zoom demand for the FZ zoom that was available for the F3. I am using this lens on my F5 but only in manual mode. Is the tip of the lanc male going to pin 2? Is the ring going to GND? I can’t remember exactly, but it doesn’t matter. It’s a simple contact closure, so as long as the two pins get connected it will work.